So this is Aaron Yan. He is a 32-year old Taiwanese actor. Read on after the jump for more juicy details. He’s got abs by the way. There is no wonder why he is a matinee idol. He looks damn good and he is famous. Fans are going gaga for him. But recently, his career has been stricken by an issue brought up by a guy who identified himself as the actor’s then-boyfriend. He learned of Yan’s alleged cheating with two other guys which may have aggravated him and escalated the issue by exposing Yan in the media. 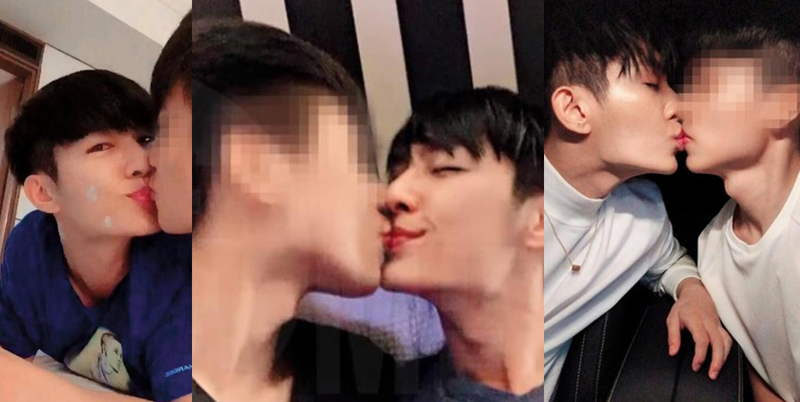 He posted images of Yan kissing each of his three “boyfriends” in three separate photos. Media has since picked up the story and it’s become one hell of a mess. This eventually caused the actor to be outed without his consent. The ex-boyfriend also said that Yan has been generous to him throughout their low-key relationship. Yan would take him to trips abroad, invited him to parties and the actor even paid his rent. But these all changed after about two years of their relationship. He said Yan became cold and was never the same which prompted him to investigate. He then found out that he was not the only one. And to his surprise, he’s been cheated with not just one but two other men. Both parties somewhat failed each other. Yan said he’s sorry for not handling relationships properly so it’s clear that the actor cheated one way or another. However, does outing him justify his cheating? Because again, “coming out” should never be anybody else’s business. They have reasons for not coming out. In this case, Yan is an actor in a country where he may not land a role for being who he is. It should have been his journey and not by someone else. He may have cheated but the “boyfriend” could have privately confronted him about it instead. Talked it out. But he lost it and handled it the worst way possible. On the other hand, Yan may have taken advantage of his incognito relationship and took two other guys in his wing because it’s thrilling. He is rich, good-looking, and famous. It’s basically saying he can get as many guys as he want but of course, you cannot just do anything you are capable of without thinking of possible implications. Yan’s management has since told the media that the actor has never cheated and dismissed the issues as “fake reports” that they will be taking matters of with their lawyer. The actor has also issued an apology to his fans, family, and management for things the people might have taken issues with. Here’s to hoping damage control is properly effective for everyone involved.